Driving along the A6108, 3 miles to the northwest of Jervaulx Abbey, I could see a silhouette having a starang outline over houses and trees. 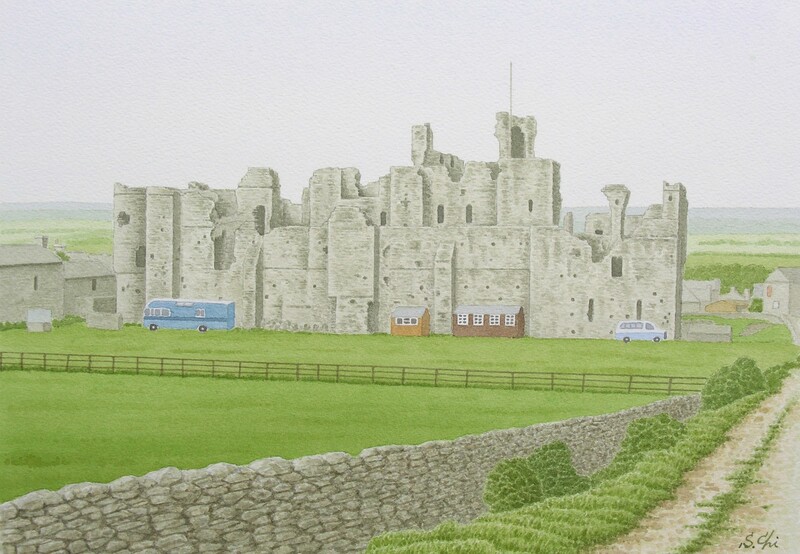 It was Middleham Castle, now in ruins, having dominated the town of Middleham. This castle was one of the castles owned by Richard, Duke of Gloucester, afterwards, Richard III. He is said to have been the most villainous king in English history. I felt something terrible and some eerie atmosphere in the ruins. The massive keep of the castle, just like a mass of rocks, measuring 105 feet from north to south and 78 feet from east to west, with thick walls of 10 to 12 feet, is one of the largest keeps in England. This impressive castle was built by Robert Fitzralph in about 1170. In the ages of the Wars of Roses, the castle was owned by the kingmaker Richard Neville, Earl of Warwick. Edward IV married Elizabeth Woodville in 1464, but before that, he was once imprisoned here by the kingmaker who attempted to marry his daughter off to Edawrd. Richard Neville rebelled with King's young brother George, Duke of Clarence, against the King in 1470. But he was defeated and killed by Edward IV at the Battle of Barnet in 1471. Middleham Castle was given to the King's youngest brother Richard, Duke of Gloucester, who was the King's right-hand man. Richard married Anne, a younger daughter of the former Earl of Warrick in 1472. Their son Edward, afterwards the crown prince, was born in the following year in the round tower at the southwest corner of the curtain walls, so the tower is called "the Prince's Tower". In the ages of the Tudors, Middleham Castle was left to fall into ruins. In 1646 the castle was rendered untenable and blown up partly by the Parliamentarians, and it became a quarry, literally, for the inhabitants of the town. It is said that the half of the houses of Middleham were built by using the stones taken away from the ruins of the castle. Local legend says that any light carried into a stone passage beneath the ruins is extinguished by the mysterious unknown hand, and treasure is buried near there. Middleham, which was called the "Windsor of the North" in the glorious old days, is now a quiet town and the centre of the dales' hikers. 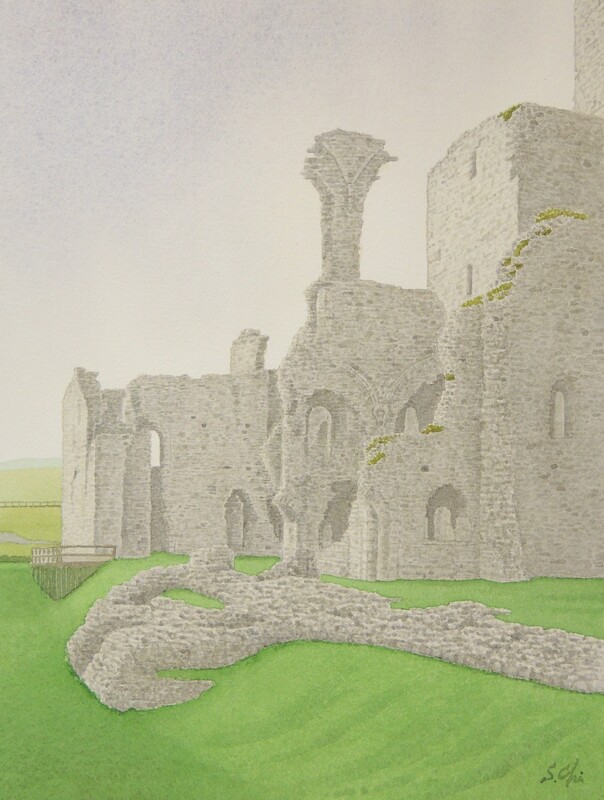 I never forget the ruins of Middleham Castle from which I started a journey to trace the life of Rityard III in my previous book titled "The View of England from Yorkshire". Was King Richard realy a villainous king as is believed even today? I think the view was forged by the Tudors and Shakespear's play. I followed his life from the ruins of Middleham Castle to Bosworth where he was killed by Henry Tudor, Earl of Richmond and lost the Crown. I treated it in my previous book. I now believe firmly that Richard was not such a bad king. I support this view: Henry Stafford, Duke of Buckingham was involved in the missing of two sons of Edward IV, Edward V and Richard, Duke of York, in the Tower. Then the Duke of Buckingham ordered Sir James Tyrell to murder the two. Then, two rogues in the employ of Sir James carried it out. Further, I am sure there was a conspiracy that behind the Duke of Buckingham, the case was plotted by Henry Tudor and John Morton, Bishop of Ely and afterwards a cardinal, Henry VII's Chancellor and the Archbishop of Canterbury.